Before good clean public drinking water was available it was often safer to drink beer or ale than polluted river water, so it is not surprising that the area housed a number of breweries. Goding’s Lion Brewery building, near Waterloo, was erected as a storehouse in 1836 and was topped by a lion made of Coade Stone. Breweries had been active in the Stockwell SW9 area since at least 1801 (and possibly as far back as 1730) with the local springs providing a good source of water. Indeed, the area was named after a well, with the other half of the name coming from ‘stoc’, which was old English for a tree trunk or post. Hammerton Brewery, a large site situated at the bottom of Lingham Street, was acquired by Charles Hammerton in the late 19th century. Hammerton lived on the site with his family which went on to give their name (and funds) to the parish hall, known as Hammerton Memorial Hall, next to St Andrew’s Church. 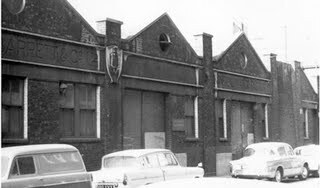 The brewery was known for being the first in the UK to use oysters as part of the process of brewing stout in 1938. 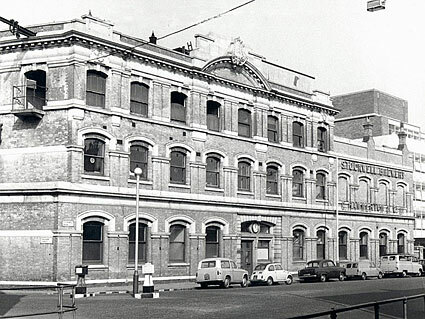 Hammerton’s brewery had closed down by the 1950s. The site then served as the Trumans bottling factory before being flattened for new housing in 2007. There is a flickr photostream by sarflondondunc showing the demolition of the site. The Barrett’s brewery building, which is attached to the warehouse, was designed by Henry Stopes (architect, palaeontologist, brewer and, incidentally, father of Marie Stopes, the famous advocate of birth control). The bottling plant, which once sported a tower topped by a giant rotating beer bottle, with red and blue flashing lights on it, was on the other side of the road. The bottling plant was struck by a bomb from a Zeppelin in January 1918 and later demolished in the 1970s. Next to the warehouse and bottling plant were terraced houses and Barrett’s Corner, part of which still exists (it’s on the corner of Fentiman Road and South Lambeth Road), was used as wine and spirit vaults for the bottling arm of the company.